rainbow, originally uploaded by jahansell. 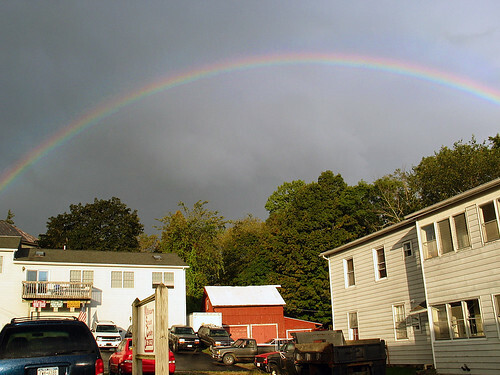 On my way to work one evening for a meeting, there was a sudden cloudburst, and this rainbow appeared over the Millerton Service Center - but I don't think Mike was still there at that hour to enjoy it! WOW! I'm glad you captured this moment. Rainbows are a great promise, according to the Bible. Good shot! But did Mike find the pot 'o gold when he got back? It looks like Mike has received a visit from John "I'll paint rainbows all over your blues" Sebastian! And I go on waiting to take a rainbow shot that I really like, like this one. amazing shot. u were able to capture a very long arc. beautiful! oh wow---one ends in Sharon, and the other is in Lakeville! Two pots o' Gold! !